It was one of those days. Actually, it was one of those weeks! We had just returned home at the end of our springtime conference schedule. We have four children: three of the four were moving/preparing a house for sale, and in some way we were helping all three. Mind you, they were not just doing these activities in the same month, but in the same week, and technically the same day! Did I mention that they live in various parts of the country, meaning our trek took us coast-to-coast? If I went into great detail, this blessings blog could easily become a book, but yes, amidst our conference travels we were packing, painting, hauling, and babysitting for both human and furry babies throughout the month. So on this crazy day when I felt rather spent, I had work at home that needed attention along with continued refinement on our CD3 curriculum and the CD4 project. I was trying to catch up with laundry, painting clothes included. I had checked all the pockets – no tissues, gum, lip balm, or various other small objects that can often be carried in them. I started the laundry and headed to the kitchen, which is adjacent to the laundry room. The two furry babies now staying with us were in need of water, and because I was in a hurry I grabbed a pitcher and poured from maybe a distance of eight inches above the bowl; okay, maybe it was twelve. I was never a physics buff, but as I poured, Newton’s third law of motion immediately popped into my mind, “For every action there is an equal and opposite reaction.” And there it was, a geyser-like shot in the air that caused a huge puddle of water, soaking the plastic dog mat and slowly flooding across the floor. Having shared my watering can woes in the last blog, I used the lesson learned from that experience and took care of the situation: I applied a couple old towels to the trouble spot, wiped the mat and the dog bowl, and poured the next “round” very slowly and carefully right at the rim. Meanwhile back in the laundry room, my washing machine sang its tune to let me know the wash was done. (It really does sing – I decided recently that the tune is some version of “My Bonnie Lies Over the Ocean.” Appropriate!) So, I unloaded all the clothes into the dryer, but before I started the drying process I noticed I had a small, light blotch of color on my wrist and on the last item I was going to put in the dryer. Oh, no! It looked like it could be ink. I’ve dealt with that hassle before, and I did not have the desire or the time to take up the challenge again. 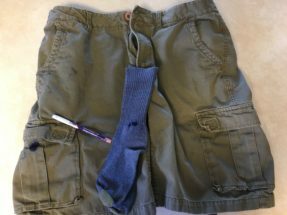 So, I removed all the clothes from the dryer and examined them one by one, patting down pockets and checking for ink stains on any other clothing. I found nothing, and there was nothing in the dryer or the washer, so I loaded it all back in the drum, shut the door, chose a cycle, and pushed the start button. Though I was grateful that everything looked fine, I felt robbed of more time than I cared to lose. Life can seem like that, and I’m sure you, dear reader, are no stranger to it. In fact, some of you have endured so much more, that my challenging account is trivial. In our story, Dilly’s encounters with his friends in Symphony City allow him to see that there is a heavenly Father who cares about every little thing happening in our lives. Not only does he care, he is actively working in ways that we often cannot see to bring help and relief from the circumstances that threaten to, at the very least, rob us of our joy and take us away from truly important things we need to accomplish. The Bible holds the stories of many people who in spite of their relationship with the Lord could make the same claim as our CD’s Dilly. Noah, Joseph, Moses, King David, and the prophet Elijah are all Old Testament figures that come to mind. Then in the New Testament after Jesus had already lived, died, and rose again, the apostle Paul had his own share of heartache. He wrote to the church in Corinth, “ “I am talking like a madman – with far greater labors, far more imprisonments, with countless beatings, and often near death. Five times I received at the hands of the Jews the forty lashes less one. Three times I was beaten with rods. Once I was stoned. Three times I was shipwrecked; a night and a day I was adrift at sea; on frequent journeys, in danger from rivers, danger from robbers, danger from my own people, danger from Gentiles, danger in the city, danger in the wilderness, danger at sea, danger from false brothers; in toil and hardship, through many a sleepless night, in hunger and thirst, often without food, in cold and exposure” (2 Corinthians 11:23b-27, ESV). Wow, Paul, if anyone would have the right to shout “Everything’s going…wrong!” it’s you! But Paul chose a better way: he prayed and trusted God in every circumstance, and he was so confident that God was in control of every situation, he wrote in Romans 8:28, “And we know that for those who love God all things work together for good, for those who are called according to his purpose.” Even when he didn’t see the results he might have hoped for, in communion with the Lord Paul penned these words, “My grace is sufficient for you, for my power is made perfect in weakness” (Romans 12:9, ESV). Somehow through his goodness, power, and great love for us, God can take the tragic and turn it into a triumph; he can even make that which is awful into something amazing! So, in the midst of my difficult morning, finally, I prayed and asked the Lord to help me. And he did! 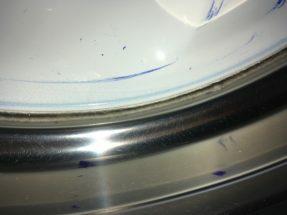 I was able to remove most of the troublesome ink from the stained clothes (minus the shorts) and the dryer drum in less time than I imagined, and I was able to dive back into the CD work that needed to be finished. I hope that you too will be able to pray and trust the Lord even while enduring hardship. It may not remove you from the difficult situation, but it will allow you to go through it with grace, peace, and endurance that only God can provide. May you find God’s grace to be sufficient in all of your challenges and trials so that you can proclaim that he is working all things for good because you are called according to his purpose. Pray to him and let him turn a crazy day (week, month, year) into his own amazing ways!